People keep asking us “what single thing do you like most”. Our answers are the same; “waking up to a blue sky”. I don’t think we could ever tire of that. We take lots of photos; lots and lots. 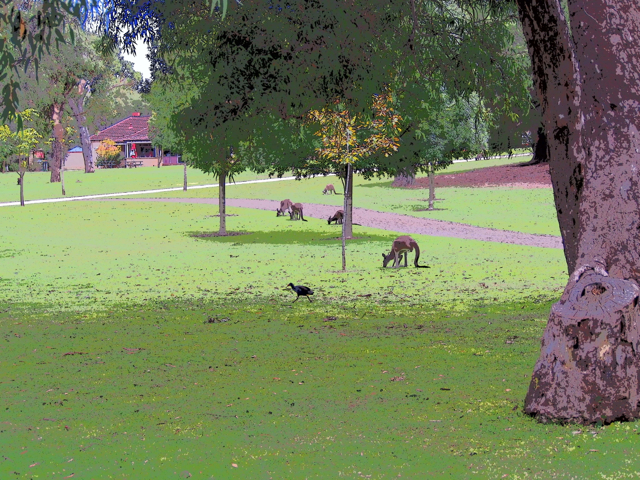 Here’s an arty one that Annie took of some kangaroos. 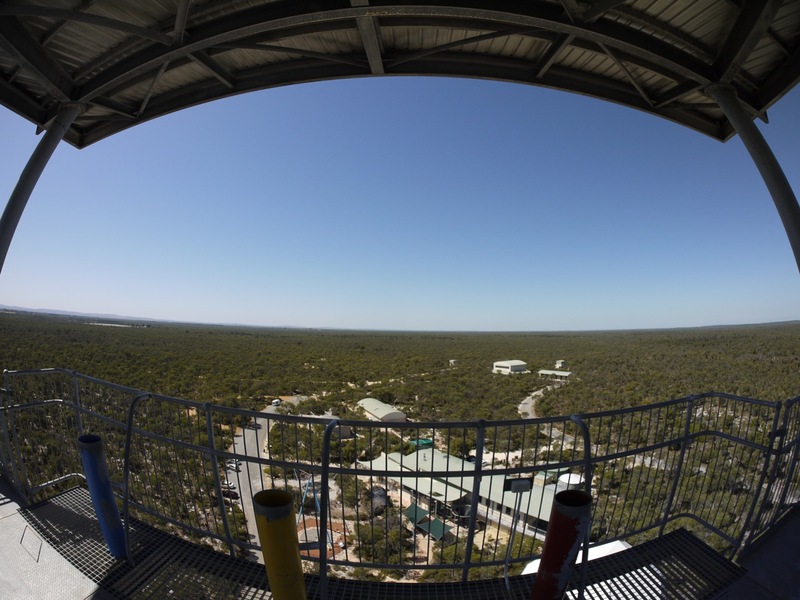 And here’s one I took from the top of a research tower out in the bush. The country is flat for hundreds of miles. I’ve felt really well here; just one nocturnal visit from the Gods of Arrhythmia and not a single crackle from my left lung. My voice is strong. The eruptions on my forehead have all gone – my skin is as smooth as a really smooth thing and I’ve not needed the heavy-duty ointment that my GP prescribed. Ladies may be interested to know that the skin on Annie’s elbows is also smooth – prior to coming here you could have filed your way out of a prison cell with them. She attributes this to the climate – specifically the lack of central heating. We’re both dreading going back to the cold. Although, as Einstein might have said, had he turned his hand to thinking about climate rather than time, temperature is relative. We’re bemused by slogans we see in the Perth shops; ‘say yay to scarf weather’, ‘say yay to coat weather’. It seems as soon as the temperature drops below 20°C people put on their hats and gloves and coats. It’s hard to get my head round the fact that it’s Autumn here – soon to be Winter. It’s still in the 30s during the day, although it cools in the evening. It’s not just the cold that makes us apprehensive; it’s the return to CancerWorld. We tend to treat holidays like commando raids – get in, do what we have to do and get out again with the minimum of casualties. So we fit them in between major hospital appointments and hope that nothing goes wrong while we’re away. I’m due a scan as soon as we get back to check on the progress (or not) of this ‘hot spot’ in my abdomen. We’ve both managed to park it for a few weeks, but now we have to think about it again. That’s just the way it is with cancer; you can chug along for a while as happy as Larry (or perhaps Thomas the Tank Engine, as I’m in a railway mood) and then every so often, you bump into the Fat Controller and head off to the engine shed for a spell of whatever happens in engine sheds. Travel in general, and flying in particular, can do strange things to the human body. The cabin in an aircraft is pressurized to around 8000 feet – about the same height above sea level as the Grand Canyon (which caused us so much trouble last year¹). It’s a compromise – if the cabin pressure at 40,000 feet was the same as that at sea-level, then the plane would have to be much stronger (and therefore heavier) and would probably never get off the ground. At 8000 feet gases in the body expand by around 20%. Especially those in the digestive system. So travel clearly not only broadens the mind – it also broadens the waistline. It also affects gases in our blood stream and organs. Last year, on our return from America, Annie’s left leg became so swollen that she ended up with a visit to the local hospital. Which is why we purchased a pair of those rather unflattering flight stockings prior to this trip. I’m reminded of the novel, So much for that by Lionel Shriver. Set in America, it tells the story of a man who dreams of retiring to an island in the sun. It’s his big passion, the one thing that keeps him going in a job he hates. But his wife has cancer. And it’s not too long before their health insurance is unable to cover any more treatment and they are forced to dip into their ‘island in the sun’ savings. Each chapter starts with a diminishing bank statement. I won’t spoil the plot, other than to say it’s a good read and spells out the difficult choices that those with cancer – or rather – their carers often have to make. (I think you’ll like the ending though). We’ve really liked Australia (or the small part of it that we’ve seen). Perhaps more so than we expected to. 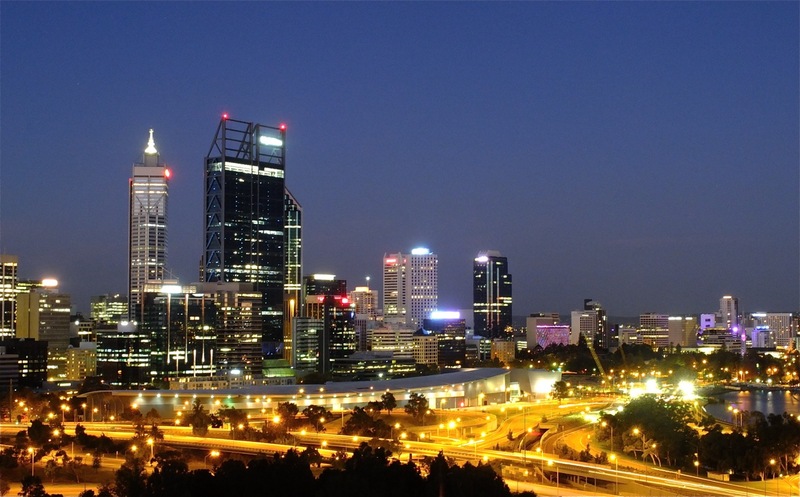 Here’s Perth from King’s Park just after dusk. It’s a popular place – people get married up here, party or simply take a picnic and watch the sun go down on their city. We’ve loved walking on deserted beaches and sitting in the bars and cafes (particularly in Fremantle) just chilling and watching the world go by. In spite of various warnings, we’ve not come across anything that wants to eat us. Perhaps the biggest surprise of this trip is that until now, I’ve never really known envy. It’s not the big flash houses with their roof-top swimming pools looking out on to the ocean, or the guy in the bar singing and playing guitar in a way that I can only dream about, that is the cause of this. It’s not Annie’s niece with her pool and out-door dining room. Nor my brother-in-law with his Kawasaki motorcycle and Mazda MX5 sports car (OK – perhaps a bit). What gives my tan a greenish tint is a man about my age, dressed in lycra. I see him everyday whizzing along the ocean road in the sun on his shiny carbon road bike. Everyday. In the sun. By the ocean. Now that really does make me jealous. Welcome back to the real world! We still have an NHS, just about. April 1 was the day that they withdrew the life support system but there’s still a chance we can resuscitate it before the vultures start feeding on the body. The change in the weather must be a bit of a shock to you – a drop of some 18C would be a bit of an insult to any skin recently adapted to eternal sunshine. If it’s any comfort I notice that current forecasts for Perth show overcast skies and rain in the next few days so just like the outlook here, though 20C higher! Interesting that bit about high altitude pressure in the plane cabin. You don’t say if you found it such a problem as the Grand Canyon. Hopefully those stockings kept Ann’s elephantiasis at bay. And then there’s the ‘pleasure’ of a week more of the Dead Maggie hysteria. Ironic the way that the ‘state spending is wasteful’ PM is being buried at vast expense by the ‘state spending is wasteful’ Government – apparently private enterprise isn’t up to funerals any more than it is up to sorting out collapsed banks without state support. That’s the politics done. Now you’ve tasted the Antipodes you’ll be ready for a visit to the real paradise on earth – NZ. Not such a lotus eating place as Perth, true, but just a stunner otherwise with saner temperatures! Hopefully there will piccies and stories to tell?